As my final project for Core Studio 3D and Core Seminar 3D, I was given about two weeks to create a “Hanging Mobile” that could express my personality and who I was, whether in an abstract way, or through something more concrete. I initially had no real idea about where to start or which materials I was going to use, or what I even wanted to express about myself. 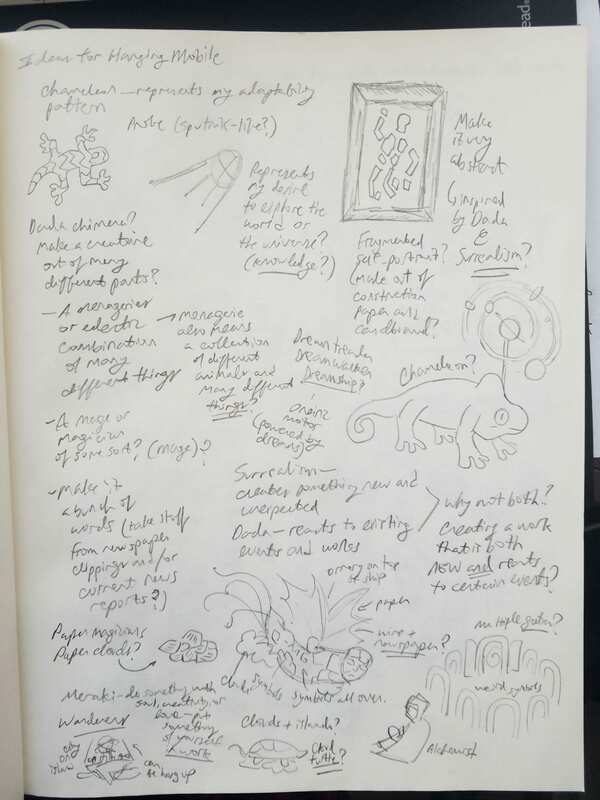 I took my time and went through many ideas which I recorded in my sketchbook, none of which went anywhere past the concept stage. 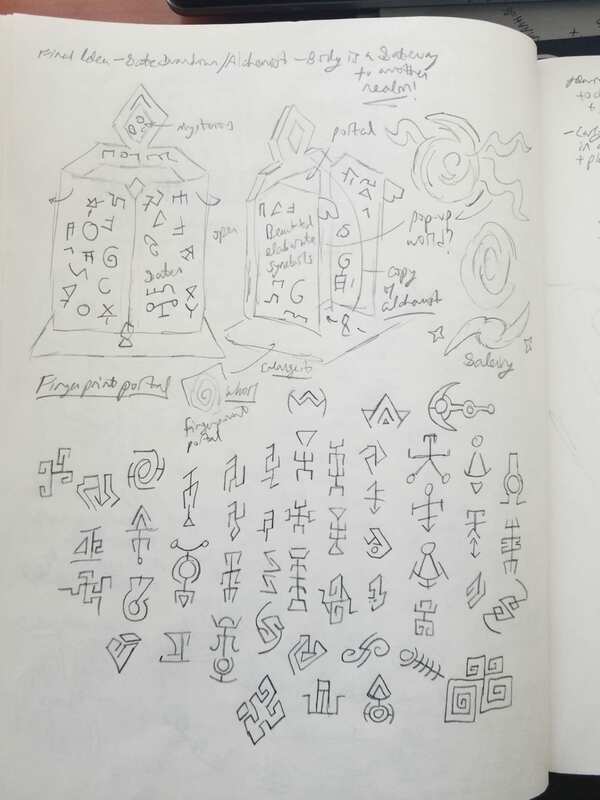 One idea that I came up with in another page of my sketchbook ended up sticking in my mind– I envisioned a gate full of strange symbols and precious gems being opened by a magician or alchemist to reveal an otherworldly dimension beyond, containing all of my interests, such as literature and art. The gate would be crafted in such a way that it would also look like a cloaked magician figure revealing himself, with the gates serving as part of his cloak. It would also have a latch and slot system that would allow it to stay closed. I specifically envisioned the gate model as having newspaper clippings cut into the shape of clouds and construction paper shapes glued either on the gates or in behind them in an attempt to combine elements of Dada artwork with a Surrealist theme in my project. I called these gates the Gates of Meraki, “meraki” being a word descended from Greek that means something to the effect “putting yourself or your love into a creative piece or work” (i.e. I was making this piece about me, so the title was appropriate). 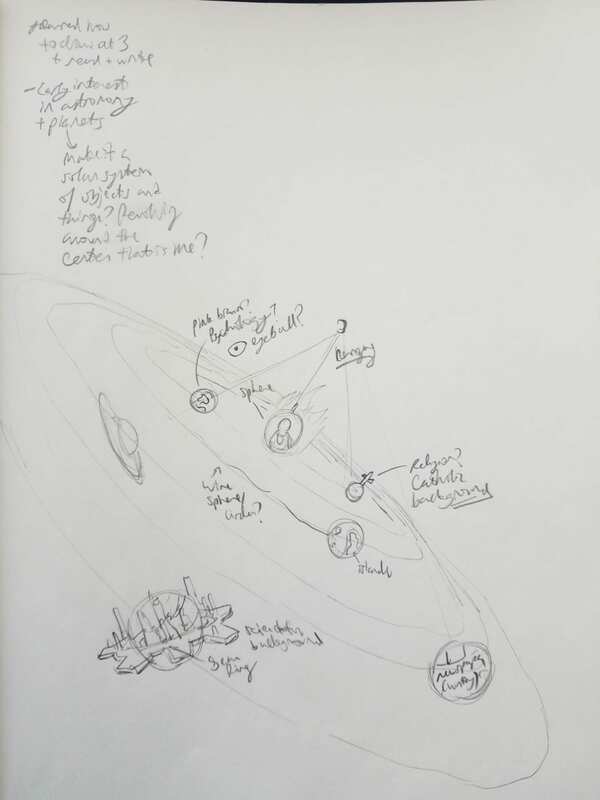 I also had an idea for a solar system model that would hang and represent me, but I had already gone with the Gates of Meraki model, and didn’t have time to redo the whole project. To assemble the actual gates, I took some leftover cardboard from previous projects and cut out a rectangle for the base, and six sided or five sided pieces for the doors and back of the gate. I also cut out three rudder-like supports to prop up the gate as it stood upright. Then I taped all of that together (the base, the sides of the gates, the rudders, etc). I then cut out the latch system and cut out a thin rectangular hole on the left door, which allowed the latch attached to the right door to snugly fit in. 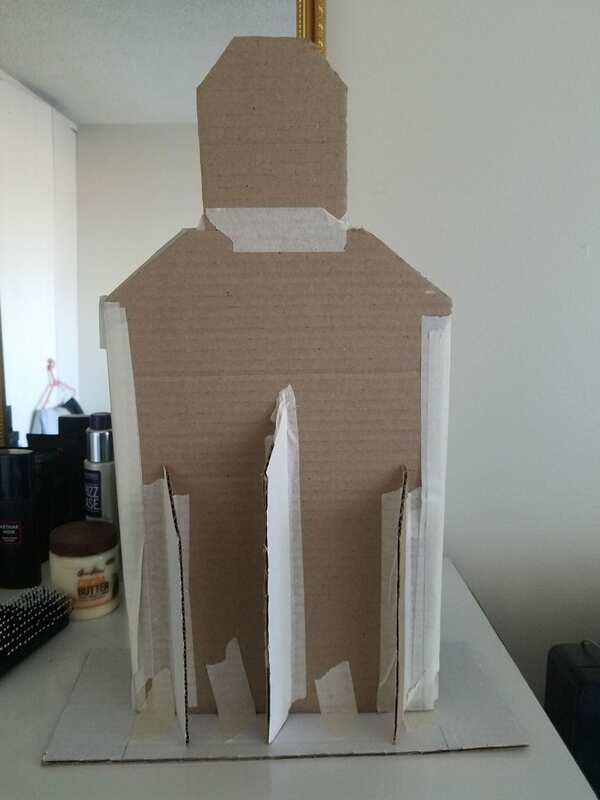 Finally, I cut out another piece of cardboard to serve as the hooded head of the magician, which I taped on top of the gates. Having done this, I then started decorating the outside of the gates with exquisite detail and gluing the insides with black construction paper that I got from Blick. I lined the outside of the gates with tape and drew runic symbols on them to give the project a more ancient feel. 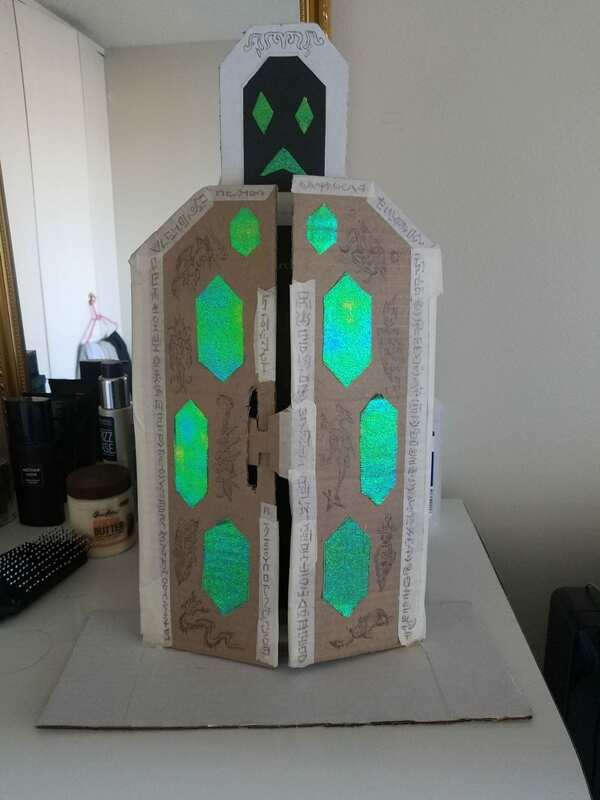 The precious gems I mentioned before are represented by the shiny green hexagonal shaped cutouts glued to the outside of the gates (these cutouts come from a special kind of glossy paper I also got at Blick). I also placed cutouts on the hooded head of the magician, substituting the eyes and mouth of the magician for green gems on the black paper. The gems here are emeralds. Emeralds are the birthstones of the month of May– the month I was born in. At the last minute I also started drawing strange creatures with pen onto the cardboard, representing my own imagination and love of drawing fantastical creatures in my spare time, as well as landscapes. 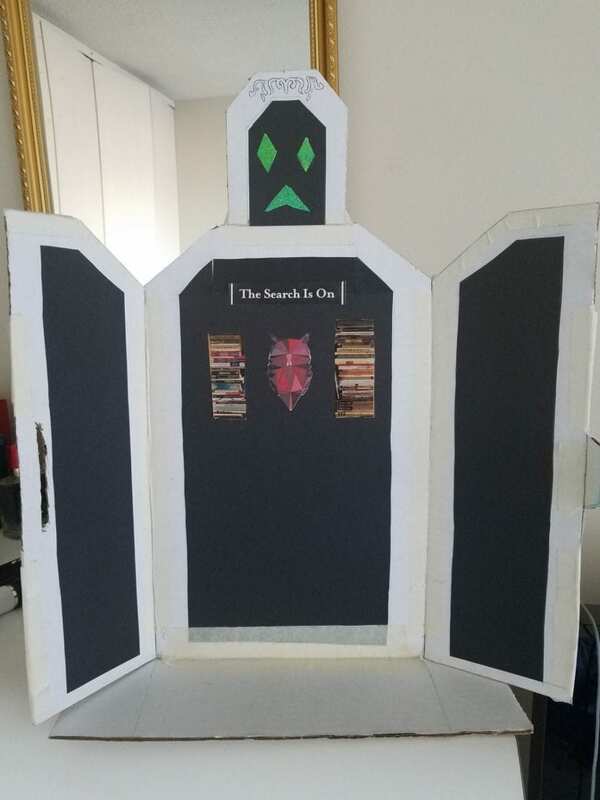 I did not have enough time to add much of what was inside the gates (“the otherworldly dimension”), but what I did cutout and glue came from a literary magazine issue of “Poets and Writers” (the bookcases and red origami owl, and the phrase “The Search is On”). The bookcases represent my love for reading, the red origami owl represents my endless quest for knowledge (owls are also symbols of wisdom), and the phrase “The Search is On” complements the idea of me constantly being on a quest to find more and know more about the world– my endless curiosity. Overall, I really like how this project turned out, despite its incompleteness. I was planning on adding cutouts of planets or of busts of philosophers floating around in this “other dimension” to represent my interests in the esoteric and in astronomy, among other things, but I simply ran out of time. Still, I am proud of the amount of thought I put into this project, as well as how hard I worked on it.